Recipes How to Make Gravy Spicy Basil Catfish -Catfish are not only tasty and delicious when fried, but also very maknyus and delicious when cooked with a spicy sauce. If you're looking for catfish cuisine menu that is different from that in general you make, you can try Recipes How to Make Gravy Spicy Basil catfish that we share this time, as well as add variety to your home cooking menu. Here are the ingredients and how to make it. The first step, after catfish cleaned, chopped his body up into pieces. Then puree garlic seasoning 2 along with salt to taste. Then coat the fish with herbs and catfish soak for approximately 10 minutes. After that, dry fried catfish then set aside. Furthermore, the Heat oil and saute ground spices, then enter the lemongrass along with lime leaves, bay leaves, red chili, cayenne pepper and tomato. After the stir-fry until fragrant tasted. Finally, add water into the stir-fry seasoning. Then add salt and sugar to taste, then wait until you see the boiling, after boiling enter catfish, basil and cook until the spices seen seep. 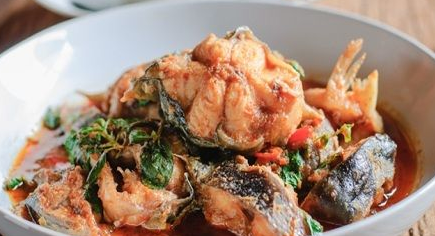 After seasoning looks to sink in, then lift and serve catfish Spicy Basil Kuah you made with rice warm. 0 Komentar Untuk "Recipes How to Make Gravy Spicy Basil Catfish"